We wanted to make the most of this past Sunday because, sadly, it was our final day in Dubai! 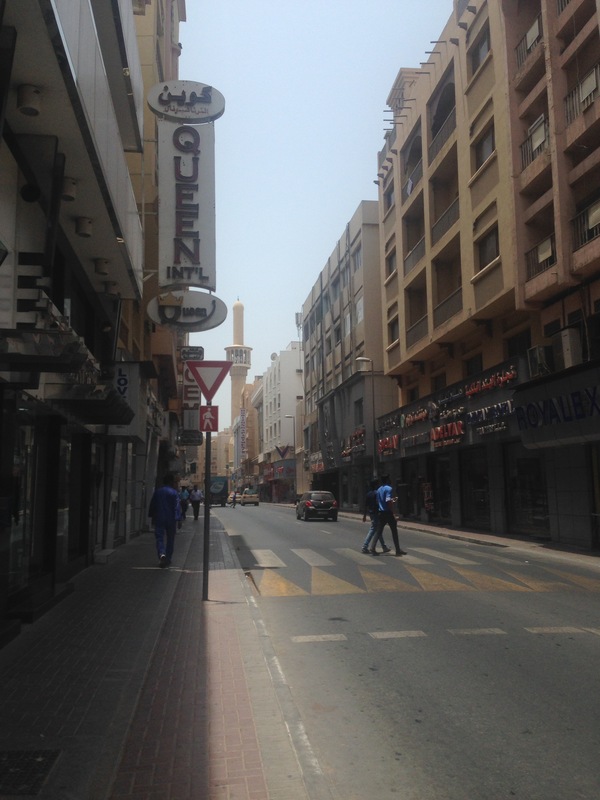 We had the whole day to explore the city, so our first stop was Meena Bazaar, a famous shopping area in Bur Dubai. Contrary to popular belief, the Bazaar isn’t actually a souk (outdoor market); it’s a few streets filled with little shops selling clothes, jewellery, textiles, and souvenirs. After passing some empty streets lined with modern-looking buildings, we turned a corner and I immediately felt like we had stepped into a city in India. The streets were dirty with garbage and had puddles of something that did not look like just water, many of the buildings and stores appeared to be falling apart, and Indian men with thick accents harangued us to come inside their stores or buy knockoff designer handbags. I realized we were probably seeing the poorer parts of Dubai that people usually don’t talk about because they either forget about them or want to concentrate on the opulence within the newer parts of the city. 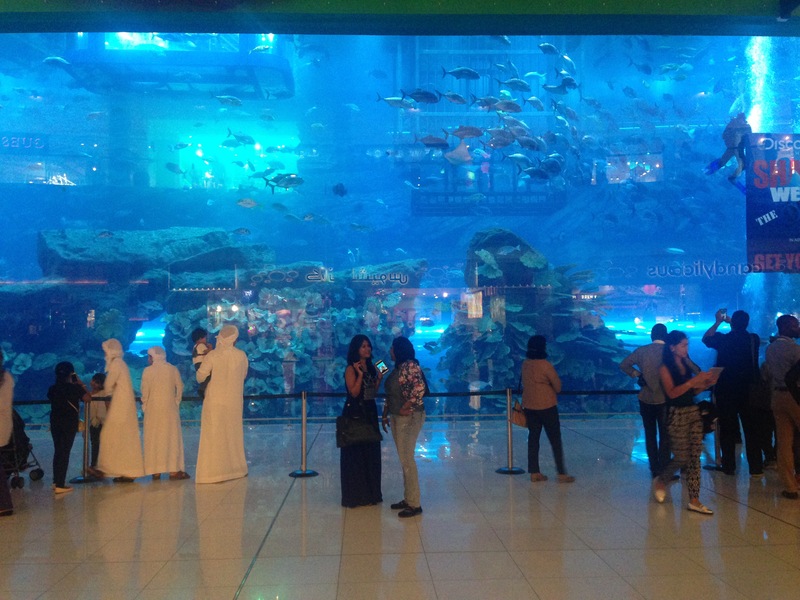 While I understand that impulse – after all, rich sheikhs, magnificent buildings and over-the-top attractions are what Dubai is known for – it was a jarring reality check to see those few crowded streets, which were just a few minutes away from swanky hotels and shopping centres. If I ever go back to Dubai, I’ll take a river boat into the older parts of the city, where you can gain a better understanding of the authentic, day-to-day lives of the locals. I think that would be more interesting to see than Meena Bazaar, which felt like a tourist trap. We had heard from friends that Meena Bazaar was overhyped and overpriced, but my parents still wanted to check out a few stores to see they could get custom outfits made. They were a little disappointed with the modest selection of stores and the poor quality of the material they found. Honestly, I think the reason we didn’t find much at the Bazaar was because you have to look very hard to find what you want. Many of the stores had cheap, dirty-looking souvenirs that were just not worth purchasing; even clothing from higher-end places was of lesser quality than expected. I did buy a $3 pair of sunglasses to replace ones that broke in Abu Dhabi, but other than that, we didn’t find any of the clothes, souvenirs and jewellery that we were looking for. If you’re planning to check out the Bazaar, my recommendation is to take someone who’s familiar with the area and will know which stores will have what you’re looking for. This was just a small section of the Aquarium. The rest of it would definitely be worth seeing! I was feeling really under the weather with a headache, stuffy nose and bad cough, so I browsed through some of the stores but didn’t have the energy to do any shopping. The mall is massive – it houses several fully-fledged department stores such as Debenhams, Marks & Spencer, Galeries Lafayette and Bloomingdale’s! After two hours we had barely covered a quarter of the mall but still managed to get lost once or twice. (Oops.) Toronto’s Eaton Centre is shockingly tiny in comparison. The upbeat Arabic music that accompanied the Fountain show made it a pretty unique experience. The choreographed waters jetting high up into the air, the Burj illuminated in front of the beautiful sunset, the hundreds of people oohing and aahing around us…it really was a spectacular show, even though it only lasted for a few minutes. Considering that it’s free to watch and just a hop, skip and away from the Dubai Mall, it should really be on everyone’s to-do list for the UAE. Our flight was at 1:30 AM on Monday morning and we wouldn’t get dinner on the plane, so we decided to eat beforehand. A family friend had recommended we try out a Lebanese restaurant called Abd El Wahab, which is situated across from the Burj and offers great views of Dubai Fountain. I’m so pleased that our friend recommended it because the food was delicious! We had creamy hummus with warm pita bread, fattouch salad (a tasty mix of greens, tomato, radishes, sumac and toasted bread), batata harra (baked potato cubes mixed with tiny chunks of garlic and tomato), and a small plate of grilled meats. I also got a bowl of warm vegetable soup, which helped clear my sinuses and soothe my throat. I should’ve taken pictures of the dishes but was too ravenous to wait! It must have been at least 35 or 36 degrees Celsius outside, so we opted to eat inside. There were many restaurants in that area, but I think what made Abd El Wahab so popular (other than its amazing food) was its proximity to the Fountain. The restaurant had a large outdoor balcony from which you could eat and/or observe the Burj. At least half of the indoor diners jumped up from their seats and rushed outside at 8, 8:30, and again at 9 to watch the show. Each three-minute performance had different music and different choreography, making every show feel like a totally new experience. After dinner and shopping, it was back to the hotel to wait for our 10:30 PM taxi to the airport. We made it to Dubai Airport in good time but needn’t have rushed as the airline had actually cancelled our flight to London Heathrow due to “technical difficulties”, whatever that means. They had cancelled it earlier that day, so there was no excuse as to why we weren’t notified of it. We spent an excruciating hour and a half standing at Air Canada’s service desk while the agents scrambled to figure out which flight to get us on so that we could still make our 8:30 AM connecting flight from London to Toronto. By the time they finally booked us on a 2:30 AM Qantas flight to Heathrow, I and several others around me had taken the liberty of sitting down on the baggage-weight scales next to the service desks. We were all tired and extremely frustrated, which is probably why the agents didn’t dare tell us we weren’t allowed to sit there. There was no way we were accepting that answer, so we took off in the direction of our gate and ran for exactly 9 minutes to get there. When we arrived, huffing and puffing with our hair and clothes in disarray, they hadn’t even boarded! We thanked the heavens that we hadn’t listened to that agent and made it to our seats with no further problems. After so much excitement, I think my family and I are pretty relieved to be home! All in all, it was a splendid vacation and I’m so thankful to my parents for taking me along with them. I’m also thankful to you, the readers, for taking this exciting journey with me through India and Dubai. I’ll be posting some final thoughts and reflections later this week, so please make sure to come back for that.